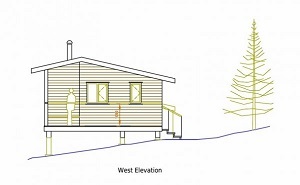 Plans have been unveiled for a new Buddhist meditation retreat centre in a Highland woodland. Aberdeen, Scotland -- 'The charity Gomde Trust Scotland has applied for permission to build 17 huts in a forest a mile east of Auldearn. The proposal has been developed over the last nine years, since the group purchased 48 acres of woodland in the area. Councillors have been urged to approve the scheme when they discuss the development at a meeting next week. Speaking to the Press and Journal yesterday from Nepal where volunteers are helping local residents recover from a devastating earthquake, group trustee Helen Cawley said she hoped the retreat would prove popular with local and international guests. “We’ve been working on this since 2008 when we first got the woodland to establish the meditation centre,” she said. “I grew up in that area and went to Forres Academy. We know the area. It’s very beautiful and a lot of people have a lot of good feeling towards Scotland. “We’ve done a lot of work in the area. This seemed like a good way of paying something back for the area. “I think it possibly will be quite unique in that it’s a very secluded woodland site where people can step back from their lives and take time out and relax. “People would book to come and stay. We will have some short courses and seminars. Work to instal electricity at the site would begin in April if planning permission is granted. The proposal involves the erection of 17 single-storey timber buildings, to be phased over a decade and built with the help of volunteers, but that could eventually rise to 26. The buildings would consist of five structures located in what is known as the Rinpoche Area, as well as a forestry store, wood store, caretaker’s house and nine meditation huts. In a report to councillors, planning officials said: “The design of the structures and the layout of the site itself is such that the environmental impact has been assessed as minimal.